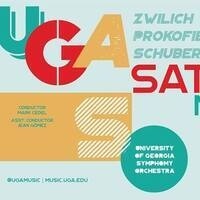 The Hugh Hodgson School of Music in UGA’s Franklin College of Arts and Sciences will feature the University of Georgia Symphony Orchestra (UGASO) in the next installment of the school’s Ensemble Series. The concert will open with Jubilation by celebrated American composer, Ellen Zwillich. Commissioned by the University of Georgia for the opening of the Performing Arts Center, an exuberant world-premiere performance of the work was led by guest conductor Yoel Levi in April of 1996. Second on the program is Sergei Prokofiev’s Romeo and Juliet, premiered in 1940. Originally written as music for the full-length ballet, Prokofiev arranged important musical sections into three orchestral suites; the UGASO will perform the first and second of the suites. Last, the performance will conclude with Franz Schubert’s Symphony No. 3 in D major, which was composed in 1815, a very productive year for Schubert and it is the same year he wrote his famous Erlkönig.